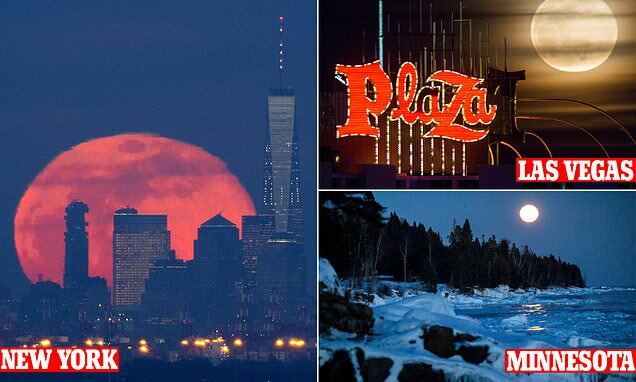 Stargazers across the United States were treated to a stunning 'super snow moon' on Tuesday night. The name for the February supermoon comes from the fact that it often coincides with heavy snowfall around this time of year, according to the Old Farmer's Almanac. The lunar marvel was a two-day event that started on February 18 and was the largest and brightest full moon of 2019 due to the almost exact overlap of the moon's perigee - its closest point to Earth - and when it is at its fullest in the 28-day lunar cycle. The point of true perigee is only six hours away from perfectly coinciding with the fullest version of the moon, meaning it appears up to 14 per cent larger and 30 per cent brighter than normal. After setting on Tuesday morning from its debut Monday night, the snow super moon became viewable again on Tuesday night at the time of moon rise in each state across the US, which was first at 5.33pm Eastern in Providence, Rhode Island and last at 7.50pm Hawaiian-Aleutian Standard Time in Alaska. It was officially full at 10.53am Eastern, but the sun was above the horizon for most, meaning the fleeting moment was missed. 'The February 2019 supermoon is special because it will be the largest full moon gracing our night skies until 2026,' said Emily Drabek-Maunder, astronomer at Royal Observatory Greenwich.